Compatible with Amazon Alexa and Google Home, allows you to run your home via one free app or your voice. Sets schedules and timers to control your home appliances. Remote control your home appliances from anywhere and make your life easier. Slim design, only occupies one socket. 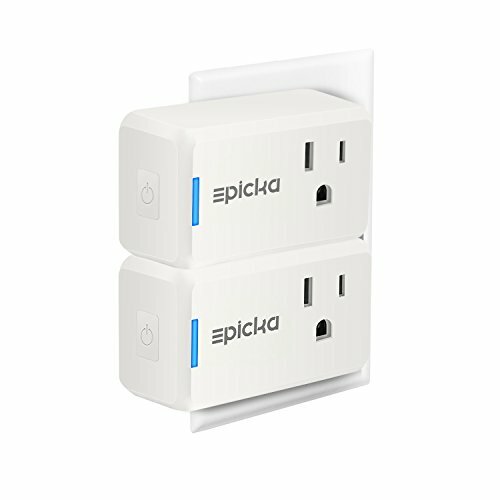 • Epicka Mini Smart Plug only supports 2.4GHz Wi-Fi networks, does not support 5.8GHz Wi-Fi networks. • Maximum power of Epicka Mini Smart Plug is 1100Watt at 110V (U.S.). Do not use Epicka Mini Smart Plug to control devices whose maximum powers exceed 1100 Watt in U.S.
• The App Compatible with Android 4.0 and higher or iOS 6.1 and higher.